Disney's Frozen recently arrived on Blu-ray and DVD, and the first thing I have to say about this film is that it is absolutely beautiful. The lighting and colors and snow and ice-effects and fabric-effects are so pleasant and amazing you just never want to look away. That being said, my wife and I weren't as crazy about this movie as others seem to be. We felt there were just too many songs, and they seemed to go on for quite a while. Now I'm not a big fan of musicals, and this is definitely a musical, more so than many other Disney films, but my wife enjoys. She thinks it might just be the singing voices that got on her nerves. We both liked the story, and there's a lot of nice humor thrown in. A lot! It actually quite a funny film. The sidekick characters of the reindeer and the snowman are fun and sweet, not annoying in the slightest, but the funniest character in the movie has to be Princesses Anna. She feels like a real, relatable character, not like the princesses we're used to seeing, and it's nice to see a princess who is not trying to run away from her princess responsibilities. Instead, she running toward her older sister, Elsa. Anna and her sister used to be very close as children, but then one day when they were playing Elsa's magic ice powers accidentally injure Anna. Thanks to the help of some magical trolls, Anna is saved, but they remove all memories of Elsa's magic and Elsa is hidden away in the castle, even from Anna, until she learns how to hide her powers. And so they drift apart, until many years later when it's time for Elsa to become queen. During her coronation party, her powers are revealed and she flees the castle, leaving an artificial winter behind to encompass the kingdom. It's a great story, exciting and funny, and beautiful to watch, I just wish it weren't so musical. The Collector's Edition includes a blu-ray, DVD, and digital HD copy. There are also a bunch of extra features, such as a Making Of, deleted scenes, and a Micky Mouse short. It's funny that the D'frosted featurette is kind of more a making-of than the Making of Frozen featurette, but both were interesting and enjoyable. 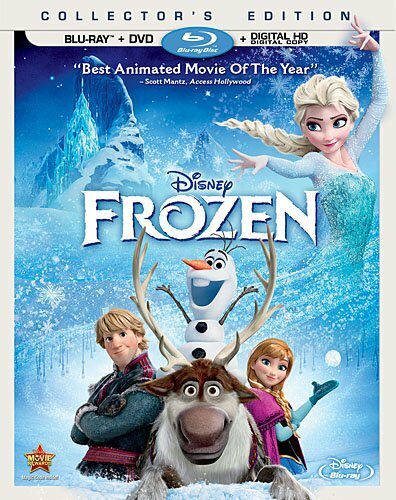 But wait, there's even another making-of called Breaking The Ice – The Real Making Of Frozen. D'frosted: Disney's Journey From Hans Christian Andersen to Frozen - Once upon a time, Walt Disney wanted to make a movie about a Snow Queen. Join the filmmakers and Disney Legend Alice Davis as they discuss the company's 75-year journey to Frozen.